Welcome back! How are you? A player asked me about the Breathing Techniques in Table tennis. Breathing is very natural, but many of you do it wrong. – Good breathing increases the performance and stamina. How to breathe correctly? – Inhale or exhale when you hit the ball? – What does the Chinese coach say about breathing in table tennis? Why Dima moans so loud? Inhale or Exhale in table tennis? What does the Chinese coach say about breathing in table tennis? Breathing sounds like a very simple and natural thing but many players do it wrong. Under stressful or panic situations, the body also naturally tenses up in the upper shoulders and neck, so some players just block breathing. During the stroke, it’s wrong if you block your breath. So it restricts blood flow to the brain. Therefore, all of our body functions are now disabled or severely lacking oxygen for muscle longevity and development. So your muscle severely lacks oxygen and tires quickly. Muscles start to hurt from the accumulation of lactic acid. This acid is the product from the lack of oxygen in the muscles. So never block your breath in table tennis. I have seen another player who inhales while doing the forehand topspin. This is even worse because this will hurt your chest when you rotate your forearm. And this will prevent you to exert the strong force. and exhale for large muscle contraction (hit the ball). This is true for many others sport and training: like doing gym, physical training, tennis. This way you can consume quickly the energy stocked in the muscle cell. Inhale in the recovery phase. Exhale when you hit! 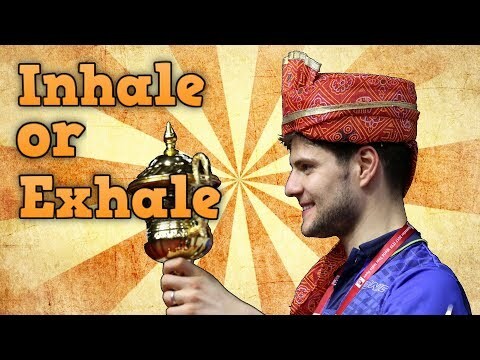 Breathing in table tennis: Inhale or Exhale? You can clearly see that Dimitrij Ovtcharov exhales when he hit the ball. He has trained a lot of physical training. During the fitness training, he breathes strongly. So it becomes his habit. If you do the gym, you will understand this. You exhale when you exert the strong force, at your power limit. So if you don’t do many bodybuilding, and physical training. You don’t need to moan like Dima. Just keep your breathing smooth, soft. Don’t block, or break the rhythm of your breath. Dimitrij Ovtcharov is currently using DONIC “Ovtcharov Original Senso Carbon”, and DONIC “Bluefire M1” max. (Info provided by Dima himself). However, some website cited that, Dimitrij Ovtcharov is using the Wadlner Senso Carbon with Tenergy 05 both sides. You should always inhale by your nose. You can use your diaphragm or your abdomen to inhale. Inhale by nose will protect your lung. Because the nose is a miraculous filter lined with tiny hairs called cilia. The cilia have many functions: they filter, humidify and warm or cool the air before it enters the lungs. You should always inhale by your nose. Always exhale by your mouth. Because you can not exhale fast by your nose. You can make the noise or not, it won’t matter. Breathing is the source of energy as in qigong, tai chi. So the Chinese coach focuses on the smooth and the rhythm of your breathing. They say that “Do it naturally”. When you do the small stroke, breathe softly. When you do a big stroke, just open your mouth, and let the body does it. But don’t block your breath! Inhale while moving, and preparing the stroke. Exhale when you hit. So you will understand that the top Chinese player like Ma Long, Zhang Jike, Fan Zhendong, Xu Xin do moan, but not excessively. Finally I found your blog. Noone answers this question for me. You are the only one. Thank you thank you again. D’abord un grand merci pour tes vidéeos toutes aussi pertinantes les unes des autres. Ta série sur power from the ground m interpelle énormément car si je comprends bien le principe, la mise en oeuvre est plus compliquée. En effet, j ai beaucoup de mal a dissocier la rotation des épaules (plus naturelle) de la rotation des hanches avant/pendant la frappe. Et encore mille mercis pour tout ce que tu fais.